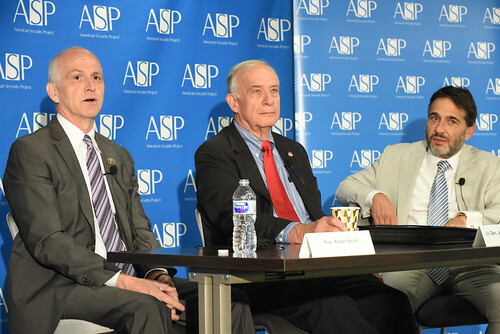 On July 12, the American Security Project hosted an event on United States- Africa security relations. The panel included Representative Adam Smith, Ranking Member of the House Armed Services Committee, and Lt. General John Castellaw, retired member of the United States Marine Corps. The discussion was opened and moderated by ASP Board Member Matthew Bergman. He expressed his concerns with U.S. foreign policy focusing too much on the military and the Department of Defense (DoD) under the current administration. A large imbalance exists between the funding the DoD and the State Department receive, with State Department funding being cut by nearly 30% this year while the DoD budget increased. The funding disparity that exists is counterproductive to building stable societies and is therefore, not a productive strategy for U.S.-Africa relations. Representative Smith made clear that the military must be involved, but priority should be placed on locally-driven development and diplomacy. LtGen Castellaw reiterated the importance of creating sustainable policies in Africa. He spoke of his experiences in Djibouti, where building a well closer to the village eased many women’s burden of having to walk long distances for water. This allowed villagers to take better care of themselves and their goat herds, resulting in economic growth. LtGen Castellaw expressed his concerns with climate change and the impact of desertification on the Sahel, particularly the farmer-herder conflict in the Lake Chad Basin. The panel closed with a moderated Q&A session. Some questions included, improving civilian-military relations, regional security in Africa, increasing cultural tolerance, and the future of U.S. national security strategy in Africa. The panelists’ concluding remarks were optimistic. Representative Smith assured that positive developments are happening and shed light on the potential for private sector involvement in creating economic opportunity in Africa. He reiterated the importance of bipartisan support in the development of national security policy and guaranteed he is working alongside his Republican counterparts on pressing issues such as U.S.- Africa security relations.